One of the most common questions regarding green and sustainable building is added cost. Here is a visual guide with relative added costs indicated as dollar signs. Click on the image below to open the PDF. It is important to think beyond only the first costs when selecting what to build. Costs of environmentally beneficial measures can be divided into 3 areas. This morning’s Arch Daily post had two projects that both transform the mundane. Similar to the use of shipping containers in architecture, they reuse regular objects in new ways, to great effect. Very creative. What is it? How do we get there? And why? And what about Net Positive? Two reasons: it is the right thing to do and because we have have to. Eat your veggies kids, be healthy. Climate change caused by carbon emissions must be reduced to minimize the impact of global warming such as flooding and drought. But you already know this. You may not know that California already has a plan to make all new residential projects Net Zero by 2020 and non residential NZE by 2030. Local jurisdictions are acting sooner. Santa Monica just passed a Net Zero requirement starting in 2017. It’s here. The doctor is telling you to get some exercise and the scale doesn’t lie…time to lose weight. Net Zero means a very efficient building with on-site renewable energy generation that in sum creates at least as much energy as it uses in a year (Net Zero) or more (Net Positive). Simple answer: Efficiency is the first and most critical step – then Renewables. Design a great building and add some renewable energy side dishes and seasoning, don’t create a pig and feed it over-sized portions of expensive energy (whether made by you or the utility). Renewable energy sources on a building or site (photo-voltaic solar panels, wind turbines, ground source heat pump systems, etc.) are far more expensive than making the building more efficient in the first place. And production of renewable systems has its own environmental impacts, so the less of them needed the better. An efficient building starts with the envelope (the perimeter cladding or skin). This means: properly designed floor, wall and roof assemblies, sealed tight with adequate insulation, with thermal breaks to reduce heat transfer, high performance window frames and glazing, appropriate building massing, orientation and the proper location and size of openings. Next comes the heating (and cooling if needed) system(s). First, implement all possible passive strategies including capturing solar heat gain and natural ventilation (operable windows). I am a huge fan of passive strategies first. Then for the mechanical systems the trend is towards highly efficient, all electric powered, heating/cooling sources using highly effective delivery methods. This typically means an air to air heat pump driven system that uses various heat exchange techniques in combination with a radiant delivery system. Such a system can allow heat from the sunny side of a building to be transferred via radiant hydronic (water based) piping to the cold side (or vice versa) before the heat pump or renewables are needed. Radiant tubing, often in the floor, puts heat where you want it, close to occupants. Finally, review internal occupant and process loads to look for further efficiencies and allow for their impact. A commercial kitchen is highly energy intensive for example, but there are tools to mitigate impacts such a equipment selection and menu design (no fries kiddies). Lighting efficiency and control systems have been vastly improved with new LED technology and sensor technologies. In addition to lowered operation costs on businesses, NZE is creates new business opportunities and jobs. Do it, you’ll feel better. And live longer. 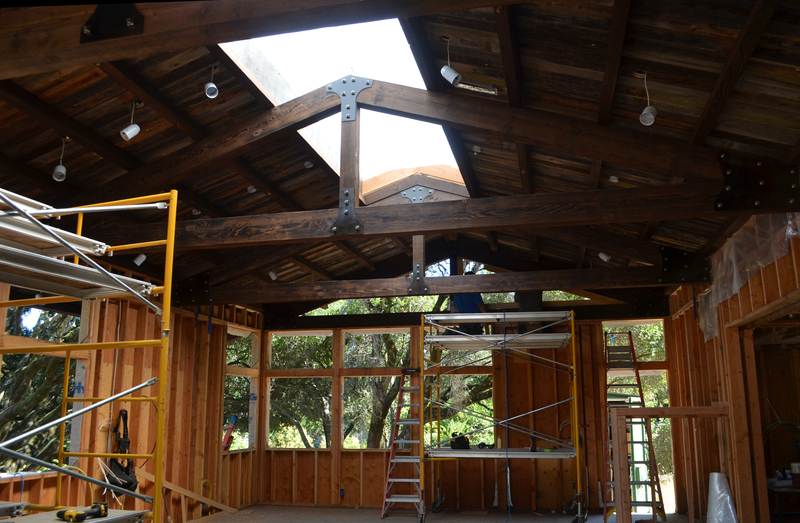 Construction is in full swing on this West County Remodel and Addition. 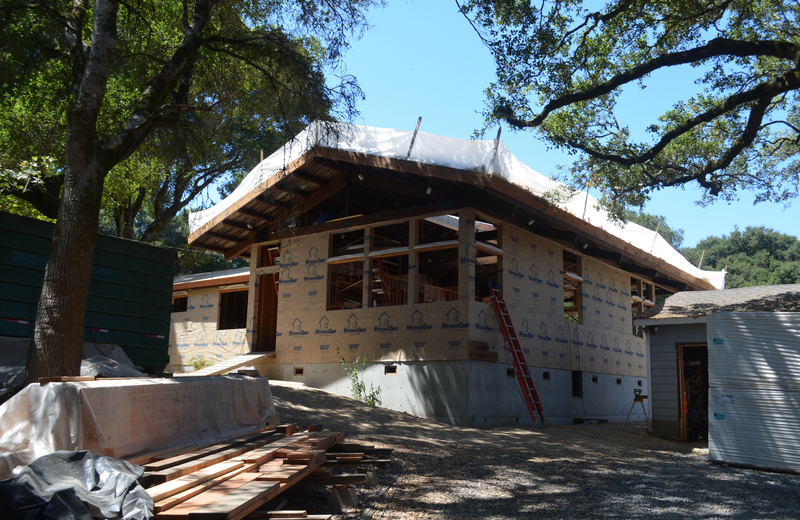 The main volume, nestled in the oaks, forms the open Living, Dining, and Kitchen space. Recycled fence boards make up the ceiling finish. Note the Shou Sugi Ban-esque treatment on the heavy timber trusses. 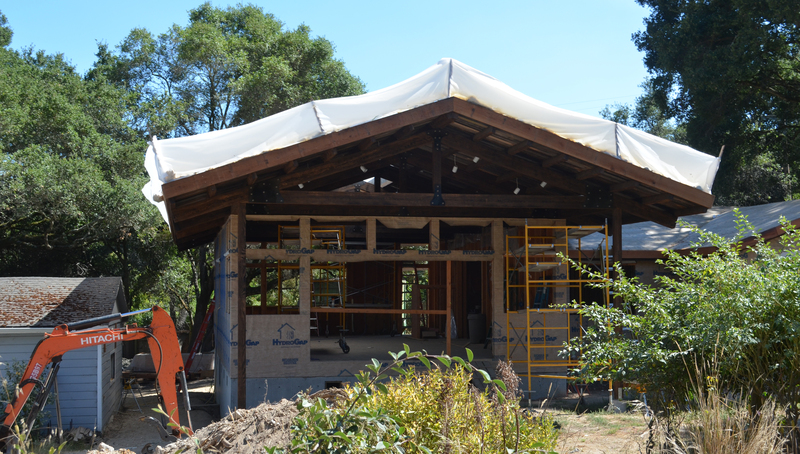 The plastic at the roof edges is temporary protection during installation of the high performance spray foam insulation. Construction by and design collaboration with Kindseth Builders.